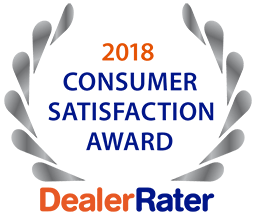 5 Star Auto Plaza is thrilled to be recognized by DealerRater as a 2018 Consumer Satisfaction Award Winner. This is 5 Star Auto Plaza’s 4th year in a row earning this honor. The DealerRater Consumer Satisfaction Award was initiated in 2015 to recognize the top reviewed dealerships on DealerRater.com for providing outstanding customer service and satisfaction. Consumer Satisfaction awards are given to a percentage of the top-rated dealerships on DealerRater.com as expressed by reviews submitted for the dealership. 5 Star Auto Plaza has proudly served the St. Charles MO and the surrounding St. Louis Missouri area since 1997. We are thankful for the support and continued business from the people in our local communities who have helped recognize our dealership for this award year after year. We look forward to providing exceptional service to our customers for years to come.